Have you decided to take that next step in your faith? 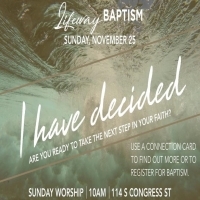 On November 25th, Lifeway will be Baptizing during Sunday morning worship. If you have decided or would like to know more, please use your connection cards for more information and to registration to be Baptized.